Inspiring to see consciousness expressing through the younger generations. "Thy will must be being done"
We received this email today from Bob Stevens. The truth in his words are worthy of your attention here. You can review more of his work by clicking on the Mastery Systems link in the right column. We have reviewed much of his work over the years. He has studied one of our favorite teachers Neville Goddard and has masterfully incorporated his teaching into his works. We have never attended any of Bob's workshops, although would have liked to. I noticed something early on in the 70’s, which has taken me years to fully understand. Any outside remedy only works IF the individual is in agreement with their health, wealth, and success. For years I marveled and struggled with the 1000’s of examples where 50% of my clients would transform quickly with the health upgrades, 50% would not. Here is a nifty collage of our pictures and videos of the Albuquerque Balloon Festival. InJoy! As much as the "Mass Ascension" brought us into a giddy mind of awe and wonder, the "Evening Glow" and "After Glow" blew our greatly expanded brains into oblivion. This is an evening event that starts at sunset and suddenly hundreds of balloons begin to come to life and rise up in the dark. This was so exciting that we ran back to the Merka-Bus to get warmer clothes, a little wine and a snack. Not much time for the snacks as we couldn't stop taking pictures. You are walking around and underneath these giant shapes and colors with the occasional eruption of volcanic fire and light coming from the burners that are the engines of the monsters. A voice over the loudspeaker would countdown and suddenly hundreds of dark balloons burst to life in sound, light and fury!... it's overwhelming! Then came the "After Glow" fireworks display. WOW! 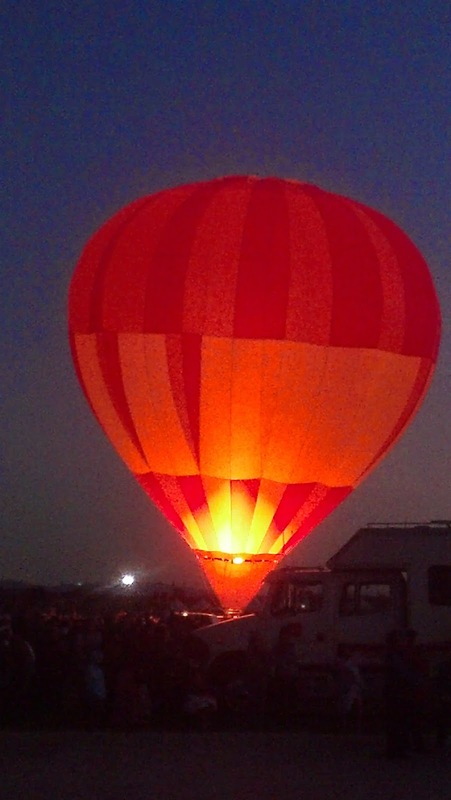 We were wandering around the launch field under the glowing behemoths when they all started coming down. We stopped and put down a blanket and in about 15 minutes all the balloons were down and we find that we are right in front of the two areas of fireworks launch, which are perpendicular to each other. We hope the pictures and videos give you at least a little bit of an idea of what it was like... but there is really no way to capture the whole of the experience. The next morning the wind calmed just enough to start a mass ascension and we were downwind from the launch field, in the Merka-Bus, waking up to the sound of balloon burners. When we arrived to the RV parking field on Friday we followed the signs and waited in a long line to register. It was very organized and it wasn't long before a volunteer guide lead us to our spot among 3,000 other RV's. Our guide lead us to... get this!... the second row from the front and closest to the launch field!!! So, the balloons are launching and floating right over our heads as we make a little hot beverage and toast. Some of the balloons landed in the RV parking area... which used to be the launch field years ago. One word of advise... Do whatever you can to get there next year. seriously!!!!! If you have forgotten what it is like to have the Awe and Wonder that you felt when you were a child, then you must experience the Albuquerque Balloon Fiesta, in New Mexico. As it happened... we were visiting our good friends in Santa Fe when they mentioned this festival was starting the next weekend and we couldn't wait to jump into it! This is the largest Hot Air Balloon gathering in the world and the most photographed event on the planet... with over 500 registered balloonists all take off in a carefully orchestrated launch event called "The Mass Ascension" that starts in the dark wee hours of the morning and lasts for several hours. This event is 10 days long and the Mass ascension will bring an estimated 80,000 people to watch. We arrived on Friday with the event starting on Saturday in our "Merka-Bus" with car in tow and joined a rally of over 6,000 RV'ers all within walking distance of the Launch Field. No hook-ups. Everyone "dry-camping" and there to enjoy the excitement and friendliness that only such an event can evoke. It truly brings out the best in people!